This handy sized guide will help you identify the marine life commonly found in Jersey’s rockpools, sandflats, gullies and other coastal habitats. A perfect visual guide for anyone who enjoys exploring the seashore. 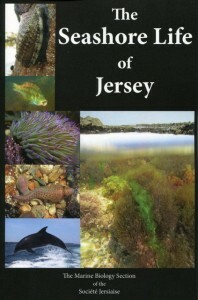 Over 550 colour photos show some 367 marine and plant species commonly found around Jersey’s coastline. The English, Latin and Jèrriais names aid identification along with habitat location. Buy online. £15 (free delivery within Jersey, add £2 for UK posting). When ordering please quote ‘Seashore Life of Jersey book’.